Scripture is viewed in many ways: the literal word of God, Divinely inspired, or just a nice collection of stories and poems. God understands it, but since His thoughts and ways are not the same as ours, we have a few problems. 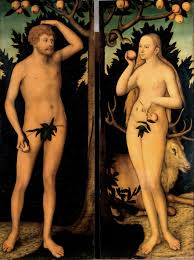 Original sin is one such example; was it literally Adam and Eve (often portrayed as fair skinned Caucasians) with an apple? Maybe it was a couple of Neanderthals named Ugg and Ugga and a fig – more endemic to the region. In any case, somewhere humankind made it clear to God that we know better than He and probably with the encouragement of Satan and the other fallen angels. Today we see women and children kidnapped while men with their hands tied behind them have their bodies riddled with bullets from Kalashnikovs by people shouting “God is great!” We see people using the heartbreak of a young man’s death as an excuse to break into liquor stores. We see “To Protect and to Serve” replaced by body armor, MRAPs and M-16 assault rifles. Jesus reopened the door between us and God. This entry was posted in Communications, Culture, Future, History, Media, People, Philosophy, Politics, Religion. Bookmark the permalink.